To help you discern which story in song best suits you and dad, below you'll find an array of diverse country tunes that come from a variety of father daughter story telling angles. Look for a description of each song, and should you feel a particular song says it best, you can then watch a video to be sure. Our dance with our father on our wedding day ranks as one of the most powerful moments in our life. The song we choose will forever represent this major marker....from Daddy's little girl to beautiful bride. It doesn't matter how focused we are on the glorious celebration of the day..once dad takes our hand for that dance, we remember almost every moment growing up under his protective wing. Straight up..this one will make you cry! The song let's everyone know that Dad loves his little girl; he loved her first, he held her first. From the first breath she took, he understood the depth of the love of a father. I don't think it's possible for dad to hold it together while dancing to this tune. The lyrics talk about how he was enough for his little girl not that long ago, and time changes everything...life goes on..but always remember 'I Loved Her First'. Although he's prayed that she'd find a man like you some day, it's still hard to give her away. Dad wonders how it's possible that this beautiful grown woman who was once his freckled face girl, grew up so fast. The love of father runs deep, and he explains to her husband that someday, when a miracle smiles up at you, you might know what he's going through. 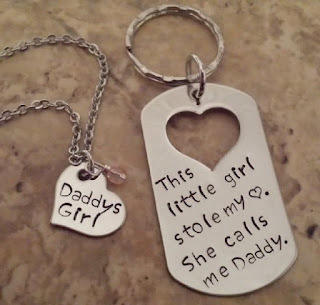 This song is ideal for a close father daughter relationship where daddy's always looked upon his little girl, as a little girl...and watching her grow from his angel to a wife is like someone 'stealing his little Cinderella'. In this song story, hubby-to-be comes to see her dad to ask for his daughter's hand in marriage, and while dad leaves the room for a minute, he gets up to look at all the displayed pictures of daddy's little girl; riding her first bike, bouncing on the bed during a pillow fight, running through the sprinkler, playing Cinderella. When dad comes back and sees her future husband looking at all the pictures of his little girl, he remarks 'Ain't she something son?' and when his response is 'yah she's quite a woman', dad just stares at him - To dad she'll always be playing Cinderella, and to dad, giving her hand in marriage is like someone stealing Cinderella. This is an unconventional choice, however it works perfectly for a father daughter relationship where his little girl has him in the palm of his hands to the point that he's willing to Dance just for her...something he rarely does. If you're looking for simple lyrics that are not overly descriptive in terms of story telling, and if dad is not known to be much of a dancer, then this song could easily work for your wedding dance with him. The lyrics explain how although he normally never dances, and wasn't the type to settle down, here he is now spinning you around in circles...he'd do anything for you...you've got him in the palm of your hands. If you're looking for a song that fits a less than ordinary dad...maybe a dad who, in his day, got himself into a bit of trouble, tells it like it is, and is known for his direct honesty...but has one weakness where he can't seem to follow his own rules... 'you' ...his daughter - then be sure to listen to this one! When It Comes to You is not a mushy song and is ideally suited for a father daughter relationship where both know that dad's biggest fault is giving in to his daughter. So if you've been a little spoiled by daddy, this is your song. Also, if you want to show off some of your dancing skills, near the end it's music only, then back to the lyrics to close the song. If what you prefer in a song is something more upbeat and fun, this could easily work. This song is incredibly moving. It's sung by Krystal Keith, the talented and beautiful daughter of Toby Keith. The words will certainly make you cry, as they speak of the day she became a wife, but she'll forever be his baby girl. She thanks him deeply for everything he's done for her. Honestly...this one is the perfect father daughter wedding dance song. Be sure to check it out. Selecting the right song for this memorable occasion is certainly very important because it is something that will be replayed in your mind thousands of times over the course of your life. I love that you have recommended songs that "fit" personalities as well as conveying a message. This makes me wonder what songs each of you chose for that dance with your father. Do tell.